They’re not going to grow bananas any longer. Because they re long enough already. Tom: What did the banana say to the elephant? Tom: Nothing. Bananas can’t talk. Mandy: Our teacher went on a special banana diet. Mandy: No, but she sure could climb trees well! Try picking it up. If you can t, it’s either a monster or a giant banana. What is a ghost favorite fruit ? Boonanaa ! What is the easiest way to make a banana split? What is the difference between a banana and a bell? Because if you don’t C sharp you ll B flat. What would you call two bananas? Mother Banana: Why didn’t you go to school today? Little Banana: Because I didn’t peel well. What’s the best way to get King Kong to sit up and beg? What did the boy banana say to the girl banana? Because they don’t want to wake up the rest of the bunch. Oh, it’s all right. I know What’s inside. A banana dressed up as a cucumber ! 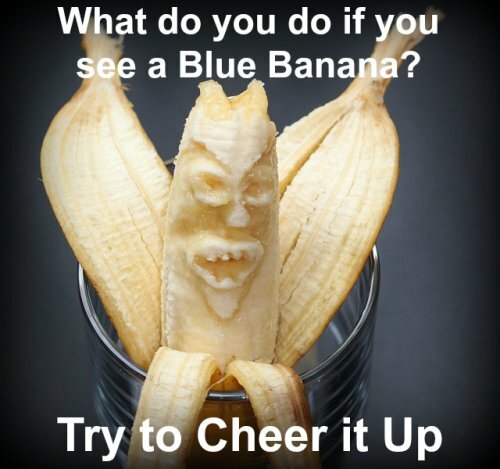 Comment on HILARIOUS JOKE about banana! Beware. This joke is about bonono not banana. What did one bonono say to the other bonono? Do u thonk this joke is lol or rofl or lmfao or lmao without the f.